Long time no post, once again :) I've been doing a lot of freelance work lately and just managed to carve out a bit of free time for this latest update. 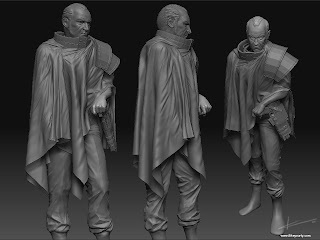 The basic sculpt of my latest characters pants is shown in the first pic. I just want to stress he WILL be wearing combat boots in the final sculpt, not pants tucked into socks, lol! I'm very happy with the way it is going, but the fun part of putting the small details will have to wait until another day at 3:30am lol! 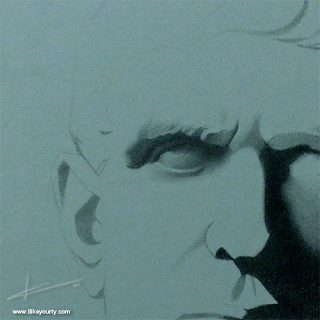 The second post is of my latest classical study of Brutus, ( the guy who killed Cesar) executed completely in graphite without smudging! So far I have an eye done but I will try to post higher quality pics in future updates. This was taken with a crappy 5mp point and shoot digi-cam. I'll get the DSLR out for the next update promise! The construct (rough draft) of this drawing can be seen in my earlier post. Last but not least the company for whom I often freelance for was kind enough to mention me on their profile page. It can be seen at www.infrared5.com although the majority of my work is still under development and not currently online. Thanks a bunch infrared5 team!